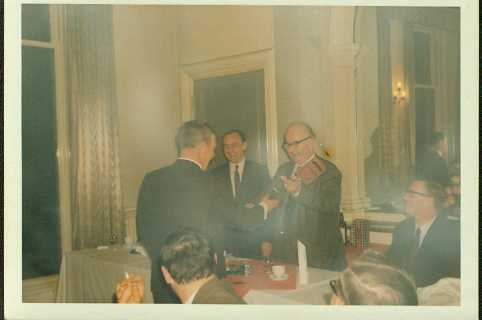 This picture shows Gordon Brookes presenting prizes at a British Bakeries Golf day in 1968. Mr. Gordon Brookes was the person who purchased Landers Bakery from the Landers family in 1949. Although shown in the Linney’s directory as J Brookes and Son’s Ltd., to be the owners of Landers Bakery. His name was Gordon Brookes and he also owned the Brookes Bakery at Old Trafford, Manchester. Alan a story related to me by Elsie Brown who had worked at Browns Bakery till it’s closure by Blanchards. She first met Jim Gascoigne there when he was general manager of Blanchards, was that when Gorden Brookes toured his bakeries, and there were quite a few. He always carried a pocket full of tanners [six penny pieces for those who are too young] and his trick was to flick a tanner into a difficult cleaning area[imagine that nowadays] and on his next visit would inspect if the tanner was still in place. If they were, the hygiene department got a rollocking. If they weren’t the cleaners had gained however many tanners they found.